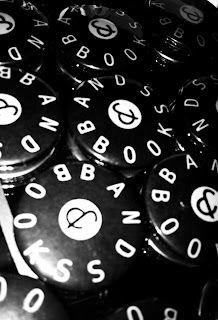 Bands & Books: Did somebody say FREEBIE? We here at Bands & Books are a generous bunch. Not only are we content with curating a FREE and FUN PACKED night of hybrid hjinks just for you, we're also giving you the opportunity to win some amazing books from our fine indie sponsor Serpent's Tail. But that's not all! The first 30 people to sashay through the door tomorrow night will also receive a strictly limited edition and highly collectible Bands & Books pin badge. When? Friday 16th September 7PM-1AM. What? Hybrid hijinks! Live words, live music and community driven book themed 'mixtapes'. Yeah, but is it free? Why, yes, yes it is! Readings from the talented Travis Elborough, Rob Auton, James Messiah and Chimène Suleyman with live performances from Queen Kwong and Bible John. All sandwiched together with your lovely book themed mixtapes. Bring your dancing shoes, QR Readers on your smart phones and loose change for the chippy across the road. AND DON'T FORGET TO BRING ALONG THE BOOK YOU'RE CURRENTLY READING FOR OUR PICTURE HALL OF FAME!